​Throughout life, they teach you about cars and driving, and being safe while in a car and while driving, and so on. They also might give you a few pointers on what can go wrong and how to deal with it. 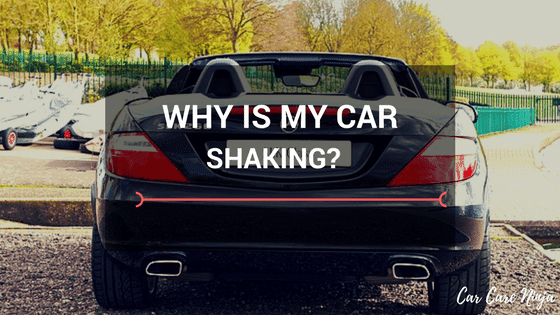 It’s not as uncommon as you might think, and there are, in fact, many reasons why your car might be shaking. This article will cover the most common, and will hopefully help you solve the problem. ​Car vibrations tend to creep up on us- starting subtly and taking a long time to notice, which just makes them more annoying. Here’s what might’ve caused the problem. ​If you haven’t made sure your tires are properly balanced, this just might be your issue. This is a relatively easy problem to solve, and fairly inexpensive. When your tires aren’t balanced, they don’t run evenly on the road, and then your car starts shaking. If the problem is not taken care of, you’ll end up with an even bigger issue which might start to affect your other tires. ​Pay attention to how your car acts when you speed up. If it shakes more at high speeds, it is almost certainly an indication of a broken radiator fan. Similar to the tires, it becomes uneven when it breaks but it still tries to spin. This causes it to wobble, and shake your car. Fixing this problem is fairly easy. You could take your car to a professional, or if do it yourself if that’s your preference. You’ll have to let your car cool down then take out the fan. Carefully clean it, so as to get rid of any substances that might be preventing it to work properly. If you think the fan is broken, check its fuses. You can do this by holding them up to the light and making sure the circuit is connected. If it isn’t, replace the fuses with new ones. The final step is to put your fan into its rightful place. And viola! Problem solved. ​Your steering wheel is in control of your tires, and what might cause the vibrations is a loosely attached tire. If your tires are well adjusted and tightened, then you might be looking at something else. And that is a worn-out wheel. Yes, we know, it’s supposed to last you a lifetime. But in this day and age, a car has become a necessity instead of a luxury. You drive it everywhere and very often, so your wheel getting worn out doesn’t sound so unbelievable. The best thing to do in this situation is to take your car to a professional who’s well equipped to handle this problem. ​In order for the car to stop and slow down, the breaks must press against the rotor hard. The friction causes it to wear out over time, which results in an uneven surface. When this happens, your car starts vibrating. An easy way to check if this is indeed the problem is to test your brakes. If the shaking happens only when you break and stops along with the car, it’s most likely that your rotor​ has been worn out. ​Axles are delicate parts of the car which can get bent even when it seems you haven’t done anything to break something. Running over a curb, for example, can cause an axle to be bent. And yes, running over a curb isn’t a big deal. Since this is an important part of the CV joint, it’s important to fix even the slightest bent. If you don’t, the problem will lead to a lot of shaking and could even cause an accident. Also, you should make sure your CV joint parts aren’t worn out. ​Aside from letting a professional take care of the most intense problems, there are a few things you can do to check what the problem is, and possibly fix it. Your safest bet is to analyze the car completely once it cools off. If the problem is easily spotted, it’s more likely that it will be easily fixed as well. Be sure to check under the hood as well as the tires. The tires can be the biggest indication of what’s wrong, and why it’s that way. First, you should make sure your tires are in good condition. That means examining them for tears and lumps, as well as signs of degradation. Next, ensure that they’re not loose or tighten past the recommended state. This can also cause some problems. If you’ve been to a muddy or otherwise messy terrain recently, remember to check for anything that might’ve been caught in the tires and caused them to be unbalanced. If you do find anything, remove it. But if the problem is as simple as a bit too much mud getting caught between the rubber, consider yourself lucky and thoroughly clean your tires. Keep in mind that most of these problems are simple and can be fixed fairly quickly, but that there’s no shame in visiting the local car shop. These people will help you take care of any issue in the best way possible. And by checking everything before you take your car to the professionals you gain some knowledge and don’t look clueless. This is helpful since you’ll understand better what caused the issue and how you can prevent it from happening again. As you can see, a lot of things can cause your car to shake. It’s important to know what caused them and how you can stop the problem from developing further. We’ve covered the basics and the things you can do on your own, which should save you some time and money. And if you do end up taking your car to a shop, you’ll know what you’re talking about. So good luck fixing your car and drive safely!